It seems as though there’s almost always a creek on golf courses in Los Angeles – be it natural, concrete or underground. 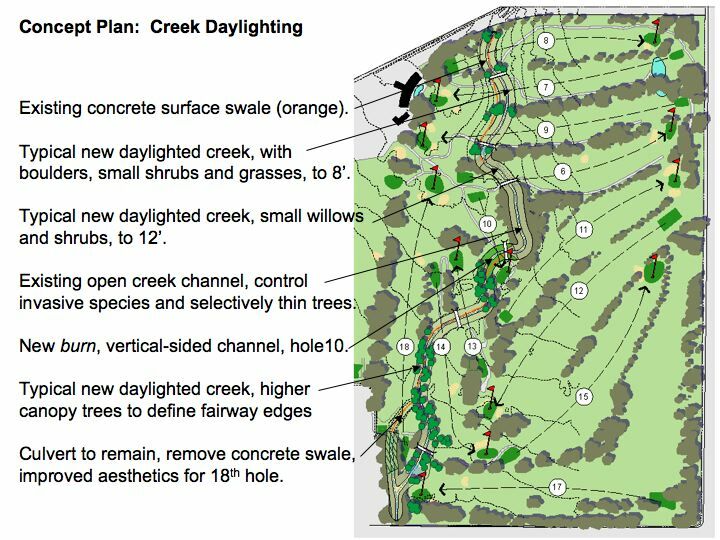 And having proposed daylighting and restoration projects at a number of our local golf courses, I was happy to see this article, A Stream Runs Through It, published in the Golf Course Industry online magazine, supporting the idea. I have found that golf courses and streams can coexist, but too often golf courses alter the stream, pushing it over the edge of the property, constraining it in ways that destabilize it, removing habitat, etc. The management problems are often quite predictable. The opportunity exists to design a golf course with an understanding of stream habitat and function, leading to a richer golf experience, fewer maintenance issues, and habitat for that remaining 5-10% of LA’s waterways. Streams can separate greens, but when they traverse greens, they can become part of the play in interesting ways. A couple of golf course/restoration locations I’ve referred to in Creek Freak posts include Devil’s Dip (I promise a post on just the golf course and restoration potential there in the near future but here’s a slide from Creek Freak’s recommendations to Mark Ridley-Thomas about it.) and South Pasadena Golf Course. Site plan for The Plaza at the Glen proposed development. The unlabeled Tujunga Wash runs diagonally from the upper left to the lower center of the plan. Image from Dasher Lawless, Inc website. Click for larger version and additional images. A 12.2-acre mixed use development called “The Plaza at the Glen” is proposed for both sides of the Tujunga Wash on the north side of Victory Boulevard west of Coldwater Canyon Avenue. That’s in the east San Fernando Valley, a half-mile upstream from L.A. Valley College where the concrete walls of the Tujunga Wash feature the Great Wall of Los Angeles mural. The proposed development site is currently the site of the Victory Plaza shopping center, and it straddles the middle of the Mountains Recreation and Conservation Authority’s mile-mile long Tujunga Wash Greenway Restoration project wjhich extends along both sides of the wash from Oxnard Street to Vanowen Street. L.A. Creek Freak found out about the project via an article on the usually insightful Curbed L.A. blog, which stated “In a savvy move, there’re also plans for a transit plaza over the Tujunga Wash that will connect the DASH with the Orange Line.” This L.A. Creek Freak is actually quite a fan of transit-oriented walkable density, and overall the project actually looks pretty good. I don’t find the idea of putting more lids over our already threatened waterways to be “savvy” … more like “nearsighted”. While it’s good, maybe even savvy, to link projects like this with transit, it seems unnecessary to carve out this transit plaza turnout, which will more likely serve to delay the Van Nuys/Studio City DASH by giving it an extra little dog-leg (on top of the proposed additional loop, which I like.) Why not just run those DASH shuttles on Victory Blvd? Improve the transit stops there, which could also support the Metro 164 bus line and activate the boulevard. The transit plaza feels more like the project is turning its back to the street; emphasizing enclosed private space at the expense of livelier public space. It would be better if the project could actually strengthen its interface with the existing park on the Tujunga Wash. The 1996 Los Angeles River Master Plan and the current Bicycle Master Plan draft update designate this area for a bike path, which the project should interface with. The project could strengthen Tujunga Wash’s bike and pedestrian connections with the Metro Orange Line, including that line’s bike and walk paths. Perhaps the development could build a portion of the bike path? Better yet and more expensive, the project could benefit greatly by restoring a portion of the Tujunga Wash as a park amenity – as a project draw! Here’s an example of where that has been proposed for development along Compton Creek. L.A. Creek Freak will be keeping an eye on this proposal… which is probably more likely to be defeated by a weak economy than by watershed concerns. If readers learn more about developments on this project (or other development impinging on local waterways) please let us know. >Frederick Reimers‘ excellent article about the Los Angeles River kayak expedition is finally on the web (after appearing in print last December in Plenty magazine). >The L.A. Times reports that California may approve new more civilized greywater regulations. Creek Freak Joe Linton is still loving his unpermitted greywater system. 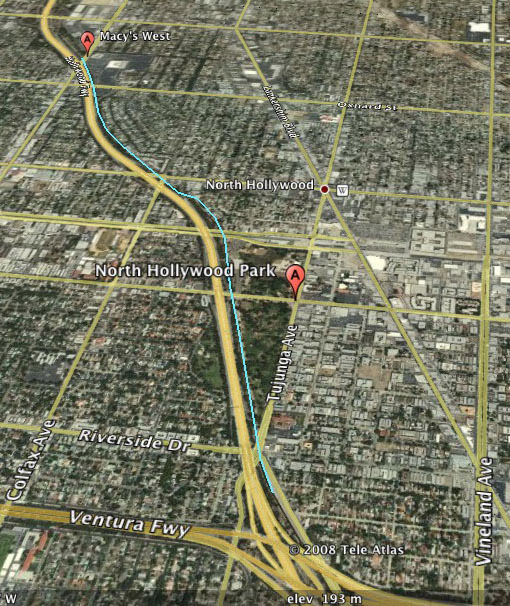 >Is Pasadena’s Colorado Street Bridge over the Arroyo Seco haunted? Dr. In-Keun Lee, Assistant Mayor of Infrastructure of Seoul, South Korea, will be giving a talk about the dramatic revitalization of the Cheong Gye Cheong. Seoul, South Korea, actually removed a dozen lanes of double-decked highway to daylight the historic creek that was buried below. The free open-to-the-public talk takes place from 2:30pm-3:30pm on Friday April 17th, 2009 at the Edward R. Roybal Board of Public Works Session Room (Room 350) at Los Angeles City Hall – 200 North Spring Street, Los Angeles, California 90012. Entrance is on Main Street. Easy access from the Metro Red Line Civic Center Station. Bloggers Joe Linton and Damien Newton teach you how to use lots of cool free stuff on the web at our Internet Skills Class on Tuesdays April 21st and 28th. President Obama invites you to clean-up the Los Angeles River at Taylor Yard on Saturday April 25th. Then go back and do it again at Friends of the Los Angeles River’s La Gran Limpieza at more than a dozen sites on Saturday May 9th. Bike the Emerald Necklace on the San Gabriel River and the Rio Hondo with the city of El Monte’s Tour of Two Rivers bike rally on Saturday May 16th. 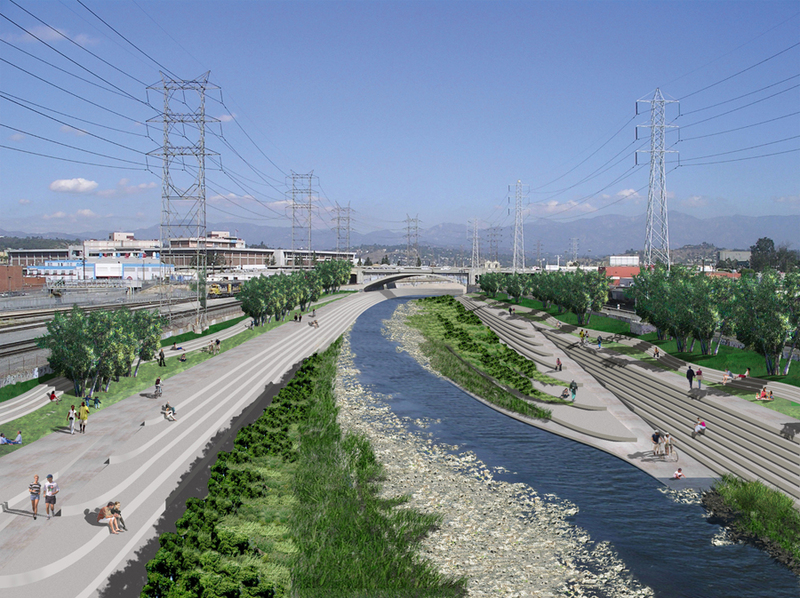 Then bike the Los Angeles River on the Los Angeles County Bicycle Coalition’s River Ride on Sunday June 7th. I know, most of my posts are tales of our waters, but it is something special to be able to sit down with an old-timer whose childhood included explorations and adventures in the days before concrete. I met Don Mullally a month or so ago, at one of the public meetings for stream protection. He was a fierce advocate for protecting our remaining waterways, and had extensive knowledge of the streams and trails in the Santa Susana Mountains. I told him I wanted to interview him about the LA River, and he went above and beyond, writing his memories down for me. I will present them, with additional notes from our conversation, over several posts. Don was born in 1929, and has lived his life in the LA area. His recollections on birds of the LA basin will also be published serially in the San Fernando Valley Audubon newsletter, Phainopepla. GoogleEarth image of path taken by Don and pals up the Tujunga Wash. Compare his description with what's here today. From 1943 to 1945, Don and his boyhood friends would take streetcars from West Hollywood over the Cahuenga Pass to North Hollywood Park, near Magnolia and the I-170 today. From there, they would hike up Tujunga Wash to approximately where a May Company (now Macy’s, he believes) was later built. “The Tujunga Wash…ran across the San Fernando Valley to the western side of the Park. It probably received storm water runoff from Pacoima Creek, Little Tujunga Creek, and Big Tujunga stream. The Wash was approximately 100 yards wide and when dry resembled a desert with very few trees and patches of low shrubs; buckwheat, I believe. Within a mile or two an abandoned gravel pit was soon discovered on the eastern side of the wash. The pit contained a lake occupied by ducks and mud hens (coots). On one occasion a group of the mud hens was noticed to be foraging beyond the shoreline. Having read that these birds sometimes froze in place when surprised, I rushed down a slope onto the birds. One became immobile, was captured, and taken home. It proved to be of little interest and was released. For Your Viewing Pleasure: Turtles, Ballona Bikes, Dorothy Green and more! >A group I don’t know about called LA River Story has done a somewhat accurate trio of documentaries beginning with San Fernando Valley tributaries: The Great Wall of Los Angeles Mural on the Tujunga Wash, the adjacent Tujunga Wash Greenway, and what they’re calling the beginning of the river in Chatsworth. Spilling forth from the San Gabriel Mountains, Big Tujunga Wash is an impressive site. Laden with boulders and white sands, it has made large contributions to the San Fernando Valley aquifer and laid the material for much of the building industry’s large quarries downstream. Yet Big Tujunga is more than a rock-and-water factory for us – it is a place of exquisite, and increasingly rare, habitats, of endangered species. Recreationists visit the Wash, following an equestrial trail that runs alongside it. A few years back, citizens objected to a proposed golf course in the Wash’s floodplain, that ultimately got built. Predictably, the wash flooded the golf course. While inconvenient for the golf course, this project was bad news for wildlife: not only did it displace habitat, even subtle changes to the wash from runoff or adjacent plantings can introduce toxins and invasive species, or change the hydrology of the Wash, increasing erosion or changing the plant composition. 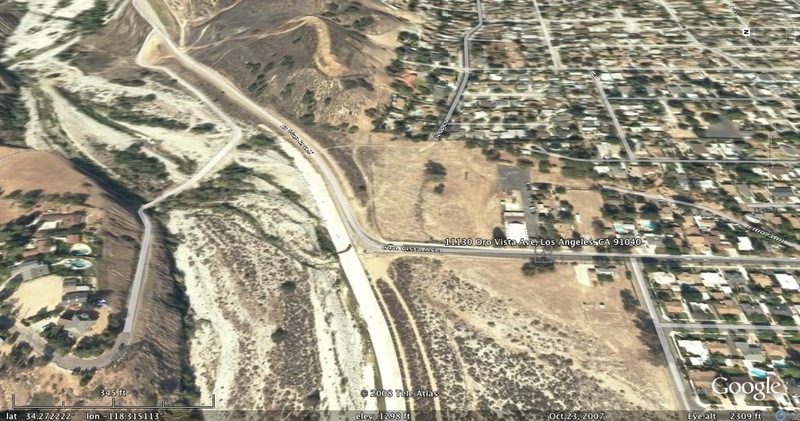 Google Earth image of Tujunga Wash and proposed development. Click on image for enlargement. Rick Grubb, environmental representative for the Sunland Tujunga Neighborhood Council, reminded me of these facts recently – and put out the word that the City is yet again considering development that could impact the wash. According to Navigate LA, over 1/2 of the property at 11130 Oro Vista falls within the 100-Year Alluvial Floodplain. It also falls within the proposed Rim of the Valley trail area, a project to link the major mountain ranges that encircle the San Fernando Valley. Rick’s group will fight for the wash at the appeal hearing before the Planning and Land Use Management committee, most likely on October 7. Considering the wild and wooly nature of this river, the proximity to threatened and endangered species, and an active wildlife corridor, it seems foolish to permit development in this floodplain. Considering, as Rick points out, that this wash is an “important source of VERY clean water for the city…” which encroaching development could impair, puts us beyond foolish. Degradation, even if piecemeal, costs us in the long run. Fortunately Rick and the Sunland-Tujunga Neighborhood Council aren’t stopping there – as Rick says in a recent email: “I am currently working…on crafting 2 new specific plan protection areas. The first is for the permanent protection of the Big Tujunga Wash wildlife corridor…as a preserve for it’s(sic) rare undisturbed natural riverine habitat, as a river trail parkway, and as a major wildlife corridor…” the second is “for ‘Hillside area native habitat protection'” that will “set…zoning land use limits, fencing (to allow for the continued passage of wildlife) design standards, and…native plant rescue landscaping design requirements…” Creekfreak wishes the STNC folks the best of luck with this, and looks forward to putting on lugsoles and trekking around with the local experts in the hills and washes of Tujunga. 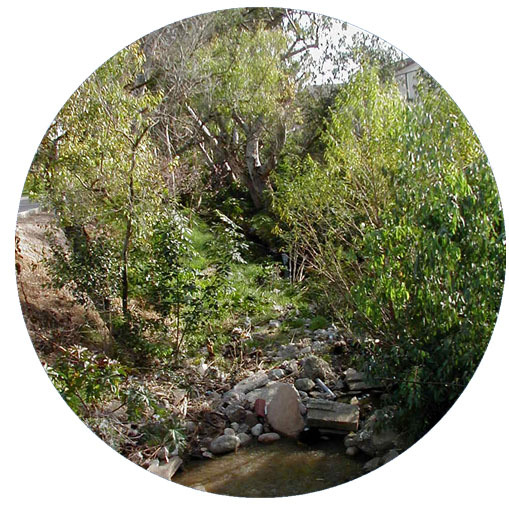 You are currently browsing entries tagged with Tujunga Wash at L.A. Creek Freak.